LeoVegas is an online gaming site that is operated by LeoVegas Gaming UK Ltd and is licensed and regulated by the Malta Gaming Authority. The site is available on desktop, as well as on mobiles and tablets. The site was originally developed in Sweden and has grown to become one of the largest mobile casinos in Europe. Its games are powered by a number of different providers, including Nextgen, Net Entertainment and Microgaming. Unlike a lot of other casinos that started as desktop sites and later added mobile versions, LeoVegas launched with both desktop and mobile sites. One of the best things about LeoVegas is that the site is very easy to navigate, so you shouldn’t have any problems finding what you want. The mobile version of the site is especially fast and very user-friendly; creating a LeoVegas account is also really easy and hassle-free. There’s also 24-hour customer support, with a free phone UK number, an international number and an email address all provided. LeoVegas even offers limited playing: you can impose time limits on your playing so you don’t spend too long gambling your money. One of the ways in which LeoVegas sets itself apart from other online casinos is that it offers a huge variety of high-quality games. In fact the site’s games come from nine different software providers, which is uncommon seeing as most sites stick to a single provider. The number of games this site offers is really impressive and there’s something for everyone. 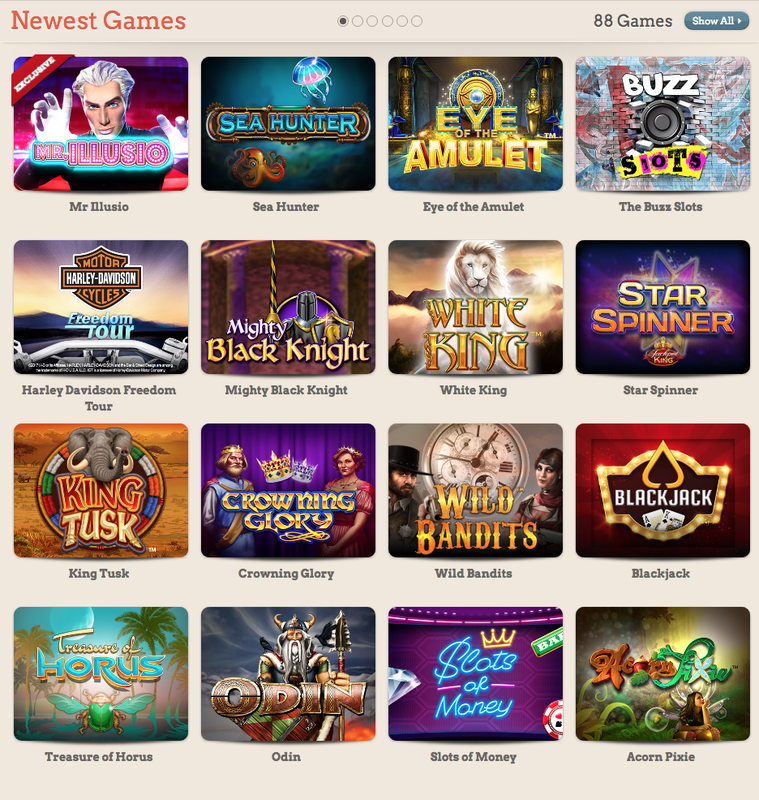 While the site focuses on slots, you’ll find plenty of other games to enjoy, blackjack, roulette, live games and more. There are well over 400 games in total, so there’s plenty to keep you entertained and coming back for more. Some of the site’s many games include South Park Reel Chaos, American Blackjack, Game of Thrones Online Slot and Vegas Party. LeoVegas does have a VIP scheme which lets you earn rewards and bonuses the more you play. The site doesn’t offer much information about the VIP scheme, though it appears to be the same as what other sites offer, where there are different levels, each offering more rewards and benefits than the last. If you like having loads of games to choose from, LeoVegas is the site for you. This online casino offers a huge selection of games from a variety of different providers – something that most other sites don’t offer. The site is also really easy to navigate and its mobile version is just as easy to use. This offer is available for all new UK players registering at LeoVegas from the 9th November 2017. Eligible players who select the Casino Bonus option when creating an account at LeoVegas will be awarded 20 Free Spins (no deposit required) instantly upon successful account creation. Free Spins can be used on the following games only; Starburst, Gonzo’s Quest, Mega Fortune Dreams, Dazzle Me, Finn and the Swirly Spin. The maximum award of the New Player Welcome Bonus is £1600 + 100 Free Spins, in addition to the 20 Free Spins awarded before the first deposit. The minimum deposit amount required to receive bonuses of the New Player Welcome Bonus on your first four (4) deposits is £10. The minimum wagering requirement to receive the Free Spins on each of your first four (4) deposits for your New Player Welcome Bonus is £5, after which the Free Spins will be issued to your account. You will need to wager your Free Spin winnings 35 times before you can withdraw any winnings. You will need to wager your first four (4) deposit bonuses 35 times using your bonus funds before you can withdraw the bonus or any winnings. When playing with the New Player Welcome Bonus, money will initially be taken from Real money, followed by Bonus money. Only wagers made with Bonus money will contribute towards the wagering requirement. Wagers made with Real money will not count towards the wagering requirement. Players who do not wish to receive any of the New Player Welcome Bonus offers must log in to their account and in account Profile Settings, select ‘not to receive bonuses by default’. If you make a withdrawal, you will forfeit the New Player Welcome Bonuses that were added to your account upon your first four (4) deposits. Bets placed on the following Slots will contribute 70% towards the wagering requirements: 1429 Uncharted Seas, Blood Suckers, Dead or Alive, Supernova, Simsalabim and Devils Delight. Bets placed on the following Slots have a zero (0%) contribution to the wagering requirement: Forsaken Kingdom, Pearls of India, Kings of Chicago, Zombies and Robin Hood - Shifting Riches and Wishmaster. All LeoVegas offers are intended for recreational players and LeoVegas may in its sole discretion limit the eligibility of customers to participate in all or part of any promotion. Customers can only have a single account with LeoVegas and as result all customer offers are limited to one per person. To be completely clear this means one offer per household address, IP, email address, telephone number, payment method (e.g. debit or credit card, NETeller etc). Accounts on shared computers are also limited to a single account, e.g. public library or workplace. We reserve the right to withdraw the availability of any offer or all offers to any customer or group of customers at any time and at our sole and absolute discretion. LeoVegas reserves the right to use player names in any announcements concerning big wins. Where any term of the offer or promotion is breached or there is any evidence of a series of bets placed by a customer or group of customers, which due to a deposit bonus, enhanced payments, free bets or any other promotional offer results in guaranteed customer profits irrespective of the outcome, whether individually or as part of a group, LeoVegas reserves the right to reclaim the bonus element of such offers and in their absolute discretion either settle bets at the correct odds, void the free bets or void any bet funded by the deposit bonus. In addition, LeoVegas reserve the right to levy an administration charge on the customer up to the value of the deposit bonus, free bet or additional payment to cover administrative costs. We further reserve the right to ask any customer to provide sufficient documentation for us to be satisfied in our absolute discretion as to the customer's identity prior to us crediting any bonus, free bet or offer to their account. LeoVegas reserves the right to amend, cancel, reclaim or refuse any promotion at its own discretion. The LeoVegas General Casino Bonus Terms apply.